a. Blood samples are obtained from each mouse at 7 wks of age (non-fasted). c. As part of ADVIA daily routine maintenance, a control run is initially performed. This usually takes about 25 min. Since controls contain human blood cells in a preservative medium, proper safety precaution is exercised with the use of disposable gloves. 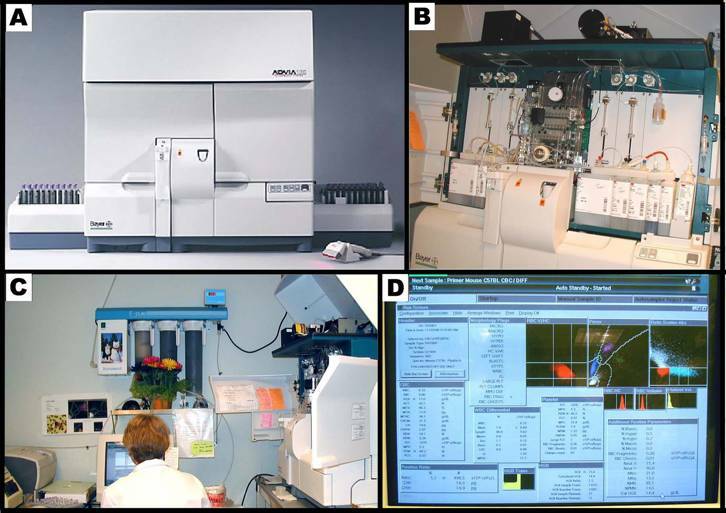 e. After each successful run, a lab screen pops up that can be hidden to return to Manual Sample ID Screen, and to review the result via the quality control (QC) button. f. After a hard copy of a successful run is automatically printed, the next sample is ready to be run. g. Values reported are those obtained directly from the ADVIA. h. No correction for the small dilution is made. Panels A-E illustrate the Beckman Synchron CX5 Delta. Panel B shows a closer look of area 1 in Panel A. Panel C presents a closer look of area 2 in Panel A. Panel D depicts a closer view of area 3, where ancillary reagents are refilled in Panel A. 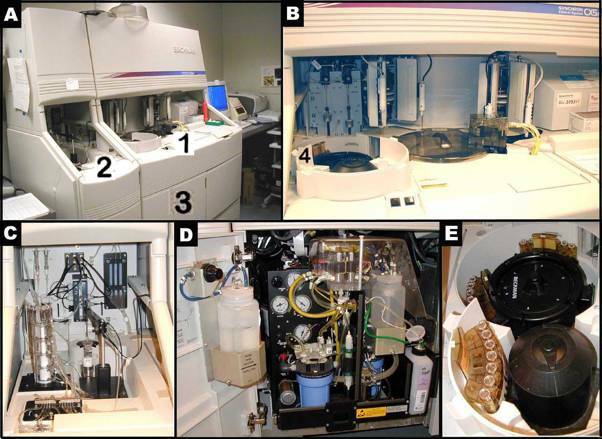 Panel E reveals the content of area 4, where samples are set up in trays for an automated run in Panel B.
a. Blood samples are obtained from each mouse at 8 wks of age. c. Blood samples are collected into pre-labeled 1.5 mL Eppendorf tubes pre-loaded with 7.5 µL of the anticoagulant Heparin 1000 U/mL, gently finger flicked and mixed or stirred, and momentarily stored in ice until all the samples are ready to be centrifuged. e. The top plasma layer is pipetted (~100 µL) into pre-labeled 0.5 mL Eppendorf tubes and frozen until ready to be assayed; remaining packed blood cell layer is discarded. -Function key F2 is used to deploy "Program Batch/Sector(s)" and "sector(s) to program:" (i.e. sectors 1-5 is programmed). When "Batch" mode activated, 7 cups possible. "Number of cups in batch:" message is displayed, the total cups for this batch is then (7 x 5) = 35 cups (the maximum number of cups that can be ran in a batch is 98). To program remaining sectors, F2 Program Batch is deployed again. e. Once a sector is finished running, the results are automatically printed, removed from the printer, and then labeled accordingly. Ethanol (70%) and/or "baby wipes"
Mice are acclimated and trained to test conditions for 3 days prior to obtaining recorded measurements. Measurements of systolic blood pressure and pulse rate are obtained from unanesthetized 10 wk-old mice with minimal restraint using the Visitech BP-2000 system. The Visitech BP-2000 system is a non-invasive blood pressure and pulse analyzer that can accommodate 4 mice simultaneously per session. In order to obtain consistency in the results, mice are first conditioned in the system the same time everyday for at least 3 days prior to an additional 2 days of recorded measurements. Panel A. The Visitech System for blood pressure and pulse measurements in mice. Panel B. Mice positioned for blood pressure measurement using tail-cuff method. a. Fully acclimated and trained mice are picked up by their tails and gently placed on a temperature-stabilized (38°C) platform. At least two thermometers are taped in the middle and on the side of the platform and covered with magnetic restrainers to provide additional means to monitor and to assure proper platform temperature. e. The mice may be left in the optical position for 5-10 min to promote body temperature stabilization. Any evidence of mouse sweating during measurement is noted, for it is likely indication of non-optimal or unregulated temperature. h. In order to obtain reliable and accurate representation of blood pressure and pulse rate, measurements are taken the same way and at the same time for 2 consecutive days. i. After all the data are collected and saved, the bandage tape is gently removed from the tail so that mice are able to come out of their restraints on their own and returned to their respective cages. The whole process is executed with the least amount of stress to the mice, while providing them an opportunity to calm down as well. j. At the end of each session the platforms are cleaned with wet paper towel and then disinfected with "baby-wipes". Diastolic blood pressure: blood pressure during peak cardiac distension and relaxation. The ECG system is turned "ON"
An array of gel-coated ECG electrodes (Red Dot; 3 M, St. Paul, MN) are embedded in the platform floor and spaced approximately 3 cm in between each other such that forelimb and hindlimb paws can simultaneously come in contact with the electrodes. Filter papers, with openings for the electrodes, are used to prevent mouse urine from short-circuiting the signals. The electrodes are connected to an amplifier (HP78901A, Hewlett-Packard, Andover, MA) by a shielded 3-electrode lead set (M1605A Snap, Hewlett-Packard, Andover, MA). The signals are digitized with 16-bit precision (DI-220, DATAQ Instruments, Inc., Akron, OH) at a sampling rate of 2500 samples/s. 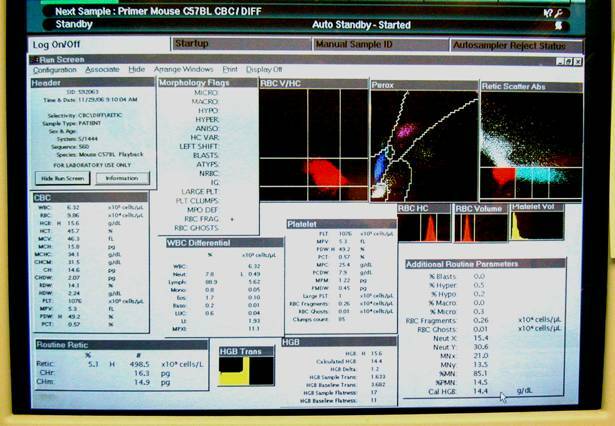 Data are transmitted to the mousespecifics.com web site (Mouse Specifics, Inc., Boston, MA) using standard file-transfer protocols for ECG signal analyses by e-MOUSE®. e-MOUSE®, an internet-based physiologic waveforms analysis portal, incorporates Fourier analyses and linear time-invariant digital filtering of frequencies below 2Hz and above 100Hz to minimize environmental signal interferences during ECG waveform processing. The software plots its interpretation of P,Q,R,S, and T for each heart beat (see below); so that spurious data resulting from unfiltered noise or motion artifacts may be rejected. Additional product information: Mouse Specifics, Inc. The AnonyMOUSE ECG Screening System for non-invasive measurement of ECG in the mouse. A 10 min period of acclimatization is implemented when using the non-invasive ECG screening system because the novelty of the environment may induce a state of anxiety in conscious mice (manifested by body tremors, shivering, and general increase in activity, all of which may introduce electrical signals that confound acquisition of ECG). Two mice, one placed on each side of the tower platform, are acclimated at the same time. As the mice become acclimated to the test conditions, they tend to become more relaxed, and more likely to contact the electrode pads, which promote recordable ECG signal. To measure electrocardiographic (ECG) parameters in conscious, unanesthetized, and unrestrained 12 wk-old mice, the AnonyMouse ECG screening system is used. The success of obtaining recordable data depends upon properly acclimatizing the mice to the testing conditions, and properly positioning the paws to be in full contact with the electrodes. a. Mice are gently removed from their cages, picked up by their tails, and propped on the ECG platform (see Figure 3 above) with the least amount of provoked anxiety and stress and then allowed to acclimate for 10 min. b. An acclimated mouse is then gently prodded and positioned at the center of the platform such that the paws come in contact with the three electrodes using a small wooden stick with a cotton swab on one end. The two front paws and left hind paw in contact with the lead plates with the mouse standing, not sitting, are optimized testing conditions. c. The ECG system is then turned ON, started and operated according to manufacturer's protocol. While waiting for signals to appear, another mouse is gently placed on the vacated side of the platform to acclimate. d. The output from the amplifier is scrutinized carefully such that only data from a continuous display of 20-30 ECG signals or waveforms (in 2-3s) are recorded and used in the analyses (see Figure 4 below). Examples of recorded mouse ECG signals. Panel A. ECG signals from a conscious or unanesthetized mouse. Note the difficulty in determining the exact beginning and ending of the T wave. Panel B. ECG signals from an anesthetized mouse. e. At the end of each session, the tower and platform is disassembled by its various parts (shields, platform, lead plate) for cleaning using mild detergent and paper towels, and then disinfected and allowed to dry with alcohol. The lead plate wherein the electrodes are attached are kept and not thrown away, while the gel-coated ECG electrodes are periodically changed and replaced. f. The cleaned platform is assembled for the next session. A piece of paper towel is placed beneath the back shield and on each sidewall of the platform to protect it from soiling. The distance of the back shield to the platform is adjusted according to the size, such that the closest channel to the platform is used for small to medium sized mice, and one channel farthest back is used for larger mice. a. Heart rate is calculated using the number of R-wave peaks. 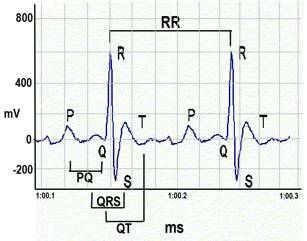 b. QRS complex is automatically determined from the beginning of a Q-wave peak to the end of the S-wave peak. c. QT interval is defined as the segment in ECG waveform beginning at the peak of the Q-wave, including the inverted and/or biphasic portions of the T-wave, and ending at the peak of the T-wave. d. The end of the T-wave of each ECG waveform is defined as the point where the T-wave returns to baseline or isoelectric line. e. Isoelectric line or baseline is defined as the average voltage between the preceding P-wave and the QRS interval. 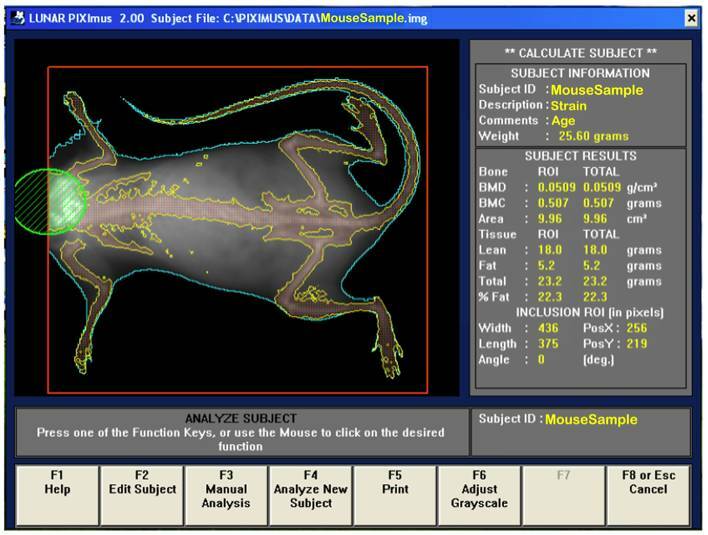 DXA scanning by PIXImus: The Lunar PIXImus small animal DXA system (PIXImus™, Fitchburg, WI) was used to assess whole body areal (a)BMD and body composition. This methodology has been validated in small animals (see Donahue1, and 2). 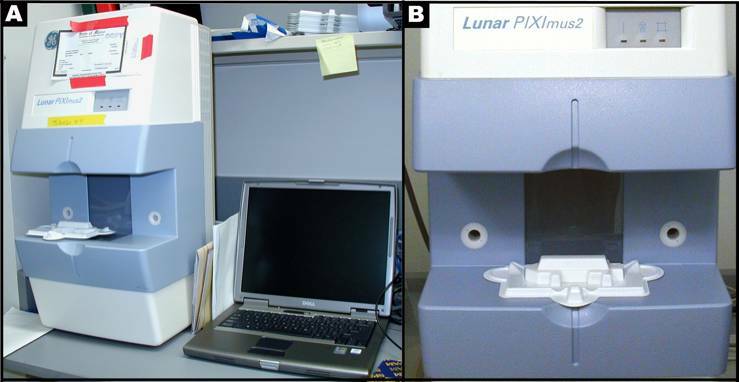 Panel A: Lunar PIXImus2 densitometer with integrated PC computer. Panel B: Close-up detail of the densitometer with specimen tray. b. Mice are weighed at 16 wks of age and anesthetized intraperitoneally with tribromoethanol at a dose of 0.2 mL/10g body weight. c. Fully anesthetized mice are positioned dorso-ventral on the specimen sticky tray (body must be within blue line on the tray; tail positioned away or alongside the body, front legs extended to the side, and neck and spine gently straightened) under the PIXImus beam path (see Panel B above). 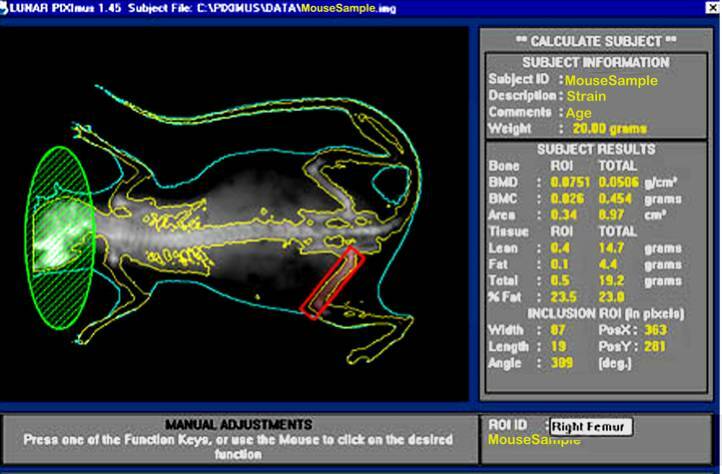 d. Trays are positioned such that the area of the head is always oriented toward the left from the investigator's point of view, and the mice are position dorso-ventra in order to scan the entire body and tail. The X-ray process to obtain a single full scan is approximately 5 min; data can be manipulated subsequently to obtain specific regions of interest (ROI's). e. Disposable plastic trays, with sticky tape for immobilizing mice, can be saved and re-used after a thorough cleaning and disinfections. Based on PIXImus validation studies (see Donahue1, and 2) DXA-estimated measurements of fat tissue correlate well with measurements obtained from chemical extraction. This is made possible by developing software versions with equations that adequately correct raw DXA-estimated measurements. a. Following the completion of an image scan the DXA system automatically implements specialized software to identify bone tissue from either fat tissue or from lean tissue based on the resulting X-ray densities at two distinct energy levels (see Donahue1, and 2). For safety, gloves must be worn and radiation safety guidelines strictly adhered to, such that technicians must be 6 feet away from the PIXImus machine during scanning.